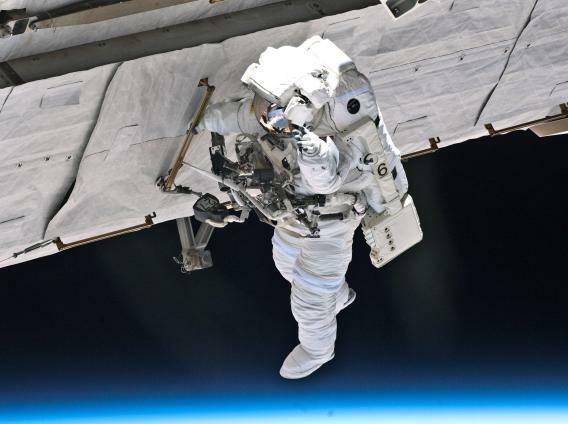 NASA astronaut Garrett Reisman participates in a spacewalk in 2010. At first it’s just weird. All kinds of things are happening to your body. Your vestibular system is all messed up—your inner ear isn’t working at all, and it’s sending garbage signals to your brain. Your heart, which is used to pumping against gravity to do its most important job, delivering oxygenated blood to your brain, is now pumping too much and your head gets all puffed up. (I woke up in the middle of my first night in orbit and wondered why I was standing on my head for a few seconds, until I realized, no—I was just in space.) When you close your eyes to go to sleep, you see lightning flashes inside your eyeballs. And you have a hard time just moving around. The first day is filled with apologies as you inevitably kick or elbow your crewmates as you thrash around like a fish out of water. But eventually you get the hang of it, and for those of us who were lucky enough to do long-duration missions, about a month into flight, you finally really get used to it. Then you wake up in the morning, float out of your sleeping bag, shoot across the space station like superman, and turn a few somersaults on the way to the galley for breakfast. Now you are a real spaceman! What is the first thing astronauts do after landing, and for that matter, what do they do the day after landing? What’s the typical daily schedule in the international space station?